We had such a busy and fun day with the tour today. 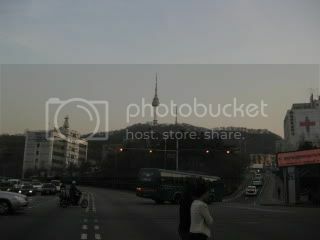 We took a short break at our hotel room and took off again for dinner. 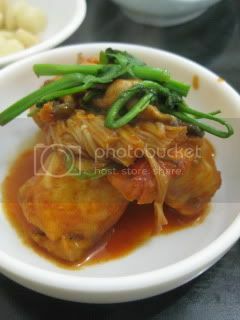 Since we loved our last blowfish dinner in Seoul last year, we wanted to have blowfish again. 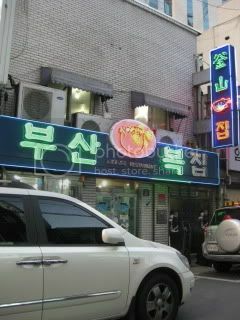 This time, I found a place called, Pusan Bukjip, and they also spcializes only in blowfish from Cheju Island. 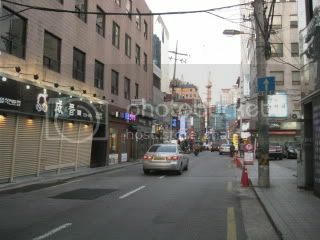 The restaurant is located on a quiet alley in Chugmuro District. 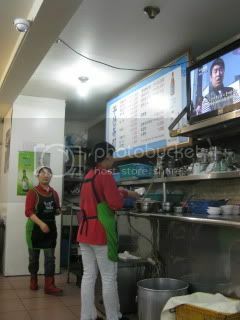 I heard this restaurant was popular among locals including Korean celebrities. 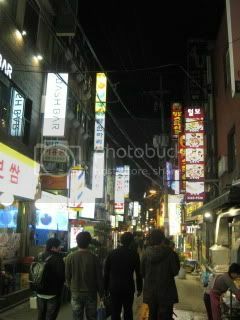 Before we went there, Mom and I were jokingly talking whether we would meet one of the Korean stars we knew...well, it didn't happen this time! This restaurant has two floors and the upstairs seemed already full. 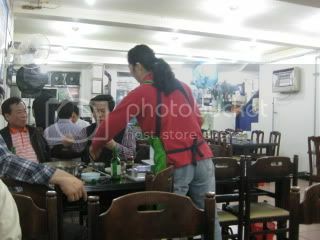 We had a table on the first floor next to a group of 3 local gentlemen, who were already ordering 5th bottle of soju! 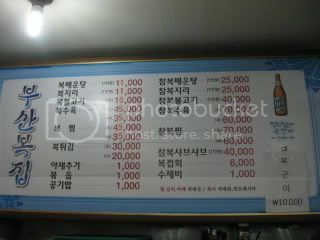 We had makgeolli again...we've lost count of how much makgeolli we had throughout the day. 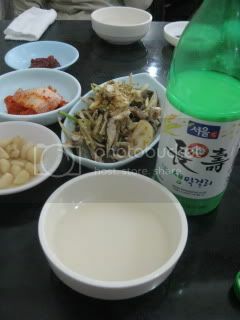 With some banchan, including marinated blowfish skin salad, this generic makgeolli tasted nice, too. 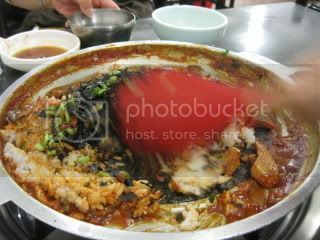 Among all the blowfish dishes, we ordered Blowfish Bulgogi (the picture is 2 orders) with fresh-caught blowfish from Cheju (it cost twice as much as the frozen blowfish). 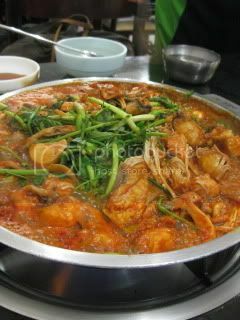 The skillet was brought to our table and I was surprised to see such a generous size (quite huge) of the dish. 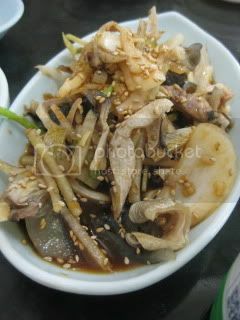 I saw chunks of plump blowfish meat covering the entire skilled with minari herbs, sliced king oyster mushrooms, and enoki mushrooms on top. 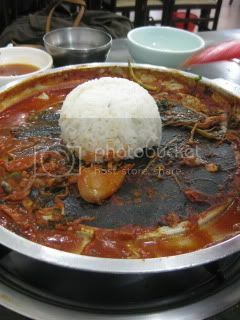 The sauce was their house specialty kochujang-based bulgogi sauce. The savory hot aroma soon filled the air once the skillet was heated. 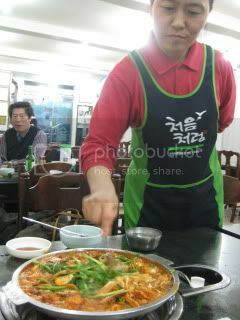 Only after several minutes, the dish was fully cooked and ready. After my first bite of the blowfish, I was just speechless. It was so insanely delicious! The fish was perfectly pure, delicate, and almost sweet itself. With the rich (and quite hot) flavors of the sauce, the fish tasted so complete. AMAZING!! I just couldn’t stop eating it. 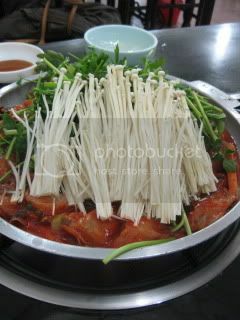 The dish paired perfectly with the makgeolli, too. The finishing “shime” course was fried rice…YES! 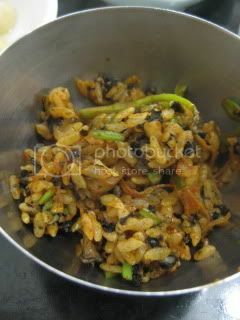 The rice was first pressed on the skillet and some nori seaweed and green onion were added. Once the bottom made some crust, the rice was ready. AMAZING again! 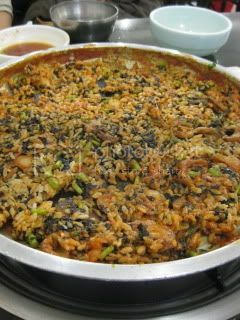 The rice soaked up all the flavors of the rich sauce (which was intensely infused with the blowfish), and it was like nothing I’d ever tasted before. Winner meal. 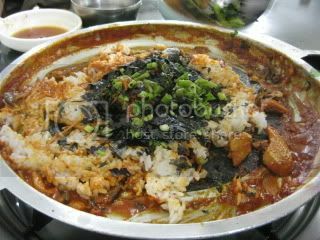 The best blowfish meal I’ve experienced!